Lieutenant Shea Quinn joins Peter Reitzes to discuss stuttering in the Coast Guard, facing stuttering reviews and assessments in the Coast Guard, stressful speaking situations and much more. Lieutenant SHEA QUINN is a helicopter pilot with the United States Coast Guard. 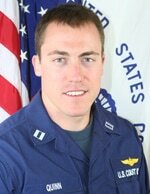 Lieutenant Quinn graduated from the Coast Guard Academy in 2009, served onboard the cutter TAHOMA as a deck watch officer, and then attended flight school. He is currently assigned to an Air Station in Port Angeles, WA, and has been a stutterer since the 3rd grade.